The first years of life are a critical period for brain development. At this time, the brain is at its most malleable, which presents a time of both great opportunity and vulnerability for a baby. Social interactions during this period are essential for a child’s language development. That’s why it’s important for parents to understand the vital role they play in their little one’s learning success. Babies start to learn about language even before they begin to speak. When they cry or babble, and receive a caring response from an adult, they are forming and strengthening neural connections related to communication and social skills. These interactions are known as “serve and return” interactions, and are critical for development. Interactive relationships between parents and their kids are not only expected, but are also essential to avoid developmental delays or a negative impact on their future well-being. The quality of the child’s environment and the availability of enriching experiences early on will be critical in determining the strength of her future brain architecture. Anne Fernald, director of the Center for Infant Studies at Stanford University, is a leading researcher on this topic. The studies she has led have found that, although verbal abilities are influenced by genetic factors to some extent, early experiences are just as, or even more, important. In one of her studies about language development, she discovered that, by the time they entered school, 5 year-old children that lacked proper language stimulation fell more than two years behind their more stimulated peers on standardized language development tests. Fernald identified three main factors parents should take into consideration in order to avoid this lag: the child’s access to directed speech, increased word quantity and quality (rich and varied), and gestures from parents. It is important for parents to remember that overheard conversations will not help their kid’s language development. Parents need to speak directly to her (making eye contact) to enable vocabulary learning. In addition, young children under the age of 2 should avoid screen viewing (according to the American Academy of Pediatrics), as this can have lasting negative effects on the child’s language development, reading skills, short-term memory, and sleep. Unfortunately, this means that you shouldn’t let your little one watch an episode of Dora The Explorer or Bob The Builder by herself very often. Even videos that claim to teach new words can actually be detrimental to your daughter’s development. If you want to stimulate her language skills, she will need frequent face-to-face interactions. As shown above, the best way to boost language development is for parents and caregivers to focus on verbal interactions. Parents should try to talk to their kids as frequently as possible -the sooner they start, the better! Parents should try to fit conversations into daily activities (whatever the activity may be, it can be explained out loud to the child!). 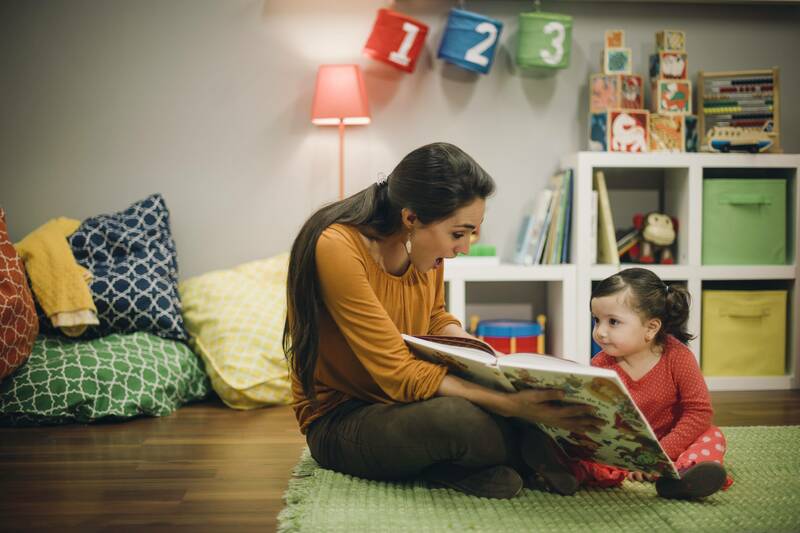 By increasing parental verbal engagement, the potential to change the course of their little one’s vocabulary growth, language development, and future reading skills is very high. Fernald identified three main factors parents should take into consideration in order to avoid this lag: the baby’s access to directed speech, increased word quantity and quality (rich and varied), and gestures from parents.